Fish-head curry is a regular meal for the gastronomically adventurous, and another local Indian regular is Indian Mee Goreng, greasy fried noodles cooked with lots of chilies, potato chunks, veggies and bean sprouts and topped with curry gravy. Rojak, which means ‘mixed’ in Malay, makes use of a lot non-Indian ingredients, all in a good way. The Chinese staple of fried tauhu (beancurd) and fishcakes join boiled potatoes and hard-boiled eggs and anything that can be deep fried with a batter and dipped in a sweet chili sauce will find itself onto the Singaporean Indian table. So if you’re ever feeling adventurous and can’t decide what you want, just ask for rojak! You’ll always get something good. So there you have it, the multicultural dinner plate that is Singapore! 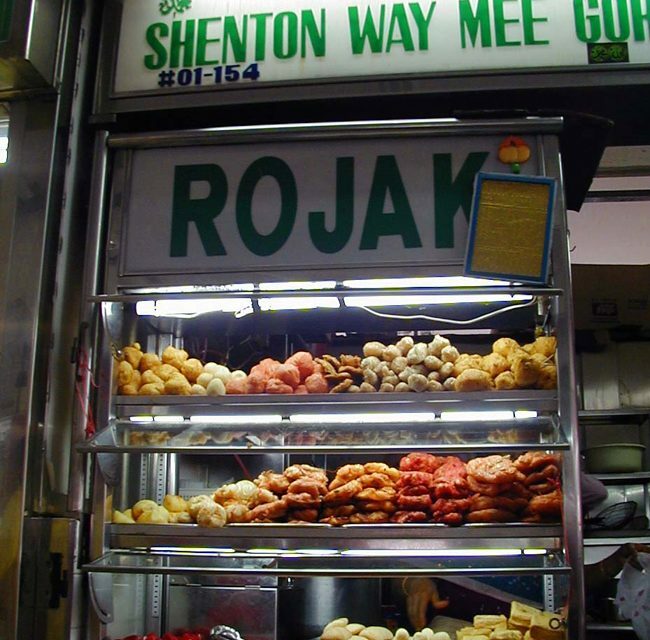 You can enjoy it all at the countless local restaurants, hawker stalls and coffee shops called "Kopitiams". 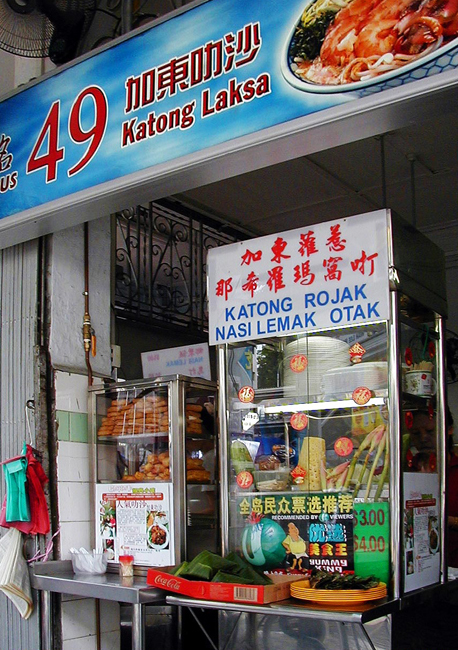 Kopitiams generally serve coffee and other beverages. Hawker Centers can range from just a couple of family stalls, to the huge centers with row after row of hawker stalls offering an often-confusing array of culinary delights. The hardest part, aside from finding a seat, is deciding what to eat! Ah Balling – A yummy Teochew dessert treat made of sticky rice balls filled with red bean, green bean, yam, peanut butter or sesame seed paste. Served hot with either a sweet clear syrup soup or other variations, including soya milk. Bak Chor Mee – Chopped noodles, usually served in a clear fishball soup. Bak Kut Teh – A real favorite, pork rib soup cooked in a variety of ways, from a salty/spicy clear broth or in a darker soya-sauce soup. Beef Kway Teow – Thick rice noodles (kway teow) served with thin beef slices or meatballs (usually beef). The noodles vary in size and color depending on the stall. Carrot Cake – Not a dessert dish! Called "chye tow kway" in Chinese, there are no carrots and it’s not cake, but it still is delicious. Steamed minced radishes are mixed with flour then fried with eggs, served up with chopped shallots or chye-poh (preserved radish). Always served and best eaten hot. Char Kway Teow – Also known as Fried Kway Teow, it’s made by frying kway teow (flat rice noodles) and mee (thin yellow noodles) in thick black soya sauce. Usually with a lot of ingredients thrown in, like eggs, garlic and small amounts of veggies. While a lot of places will throw in a few slices of fish cake it is more traditional to throw in fresh cockles when it’s almost done frying. Cheng Tng – A sweet soup dessert, perfect as a “cooler” after a spicy meal, made with sweet potatoes, white fungus, lotus seeds and ginkgo nuts. Sometimes served piping hot. 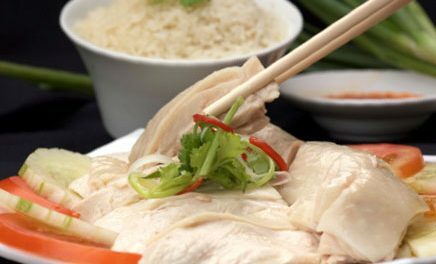 Chicken Rice – Running a close third place for top Singapore dish, this Hainanese dish is famous from the streets to the ritziest hotel tables. Soft-steamed chicken, piled on top of chicken stock flavored rice with a side of chili sauce, sweet thick soya sauce and cucumbers. Beats a burger any time. Claypot Rice – A couple of visits to a hawker center and you’ll notice people walking around with earthenware pots filled with rice and meats and vegetables. Don’t worry about the burnt rice at the bottom, that’s part of the process. Curry Rice – Any mixed dish served “chap-chye” (with mixed vegetables) and rice and curry. Pick and choose what meats or veggies you want, and if you want light or dark curry. Also known as ‘economy rice’ its an affordable meal suitable anytime. Duck Rice – Similar to chicken rice, this is roasted duck served with rice. Kind of dodgy as the smoked ducks just sit there all day on the rack, but delicious none-the-less. Fishball Noodle Soup – Any of a variety of white or yellow noodles served with a couple of fish balls in a clear soup. Fried Oyster Omelet – This dish takes a little bit of fortitude to get used to. Fried oysters in an egg omelet, garnished with green onions and herbs and a runny chili sauce. Some are thicker because flour is added, and the amount and size of the oysters vary with the price. Halal (or Muslim Food) – Dishes prepared according to the rules of Islam, amongst several things meaning that the animal was killed while still conscious and absolutely no pork. Halal dishes are as varied as any, prepared in a multitude of cultures from India, Arabia, Pakistan, Indonesian, Southern Thais and even KFC and Burger King (turkey bacon, get used to it). Ice Kachang – A great treat for the kids and the young at heart, this dessert is made of ice shavings slathered with bright red and green sweeteners and thick condensed milk. At the bottom of the bowl you’ll find red beans, corn and some yummy attap chee (a palm seed). Kway Chap – The opposite of halal, these thick rice noodles are cooked in a light soy sauce based soup with pork (the fattier the better), pig’s intestines (yes, innards), tau pok (deep fried bean curd), eggs and salted vegetables. Can you say heart attack? Lor Mee – Spaghetti-like noodles served in a hearty broth with chunks of meat like pork, fish balls, braised eggs and thinly sliced Chinese five-spices sausage. A garlic, ginger and chili paste served on the side is added to flavor for that extra zing. Nasi Lemak – My personal favorite dish, great for breakfast or lunch, is a coconut rice dish served with fried chicken wings, a fried (sometimes scrambled egg), chili paste and ikan bilis (dried minnow-like fish) with peanuts and cucumber. Before you go eewww, the little fishies are just like potato chips, so it’s not as bad as it sounds. For the best Nasi Lemak in town, try Local Delights in the basement food court at Sim Lim Square, which also has great popiahs. Pig Organ Soup – What you see is what you get. A traditional Chinese meal of pork, especially fatty pork from the belly, innards and organs like liver, kidney, intestines and dried blood served in a light broth. Boiling all this takes several hours, as does taking the courage to order. Roti Prata – This late-night post-drinking staple dish is a flat pancake cooked over a hot flat grill. Hailing from Southern India but found throughout the peninsula, it’s usually served with a curry (vegetarian or carnivore) or dhal, and can be made with eggs, onion and even cheese. Like pizzas in Italy, prata-making is an art in itself, and a talented cook will work the dough like a pro while putting on a show. 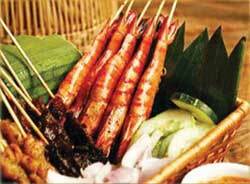 Satay – Meat on a stick, you can’t go wrong. These skewered meat strips are marinated then slow cooked over a low-heat charcoal-fire grill. Made from beef, mutton and chicken and served with a peanut sauce and chopped onions and cucumbers, and ordered five or more at a time. Teh Tarik – Tarik’ed (pulled) tea drink with condensed or evaporated milk, this dish is made by pouring the hot water back and forth between cups, or via long pours from a pitcher of tea steeped in a “sock” filter, the long pours being not just for show, the practice cools the tea. Teochew Kueh – Any of the flour-skinned sweet cakes filled with rice and yam paste, (or red bean paste) and occasionally turnip strips. Wanton Mee – From the Cantonese word meaning “swallowing of cloud” comes this minced pork dumpling with a translucent flour skin, sometimes fried. Served with a soup of thin yellow noodles, or on the side, it is the Chinese equivalent to croutons. Western Food – Oddly enough, you’ll never find this dish in the west. Sometimes a pounded beef steak, but usually a pork or chicken chop served with French fries, slices of tomato, baked beans and a piece of garlic bread. Maybe it’s what westerners used to eat in the old days; it’s sometimes a nice option to local cuisine. Yong Tow Foo – An a la carte meal where the diner chooses from an assortment of pre-cooked ingredients mostly made of bean curd and fresh veggies and mushrooms. You pick what you want (price varies with portion) and the hawker plops them in a hot bowl of soup with your choice of noodles. Zhi Char – Along the same lines as Yong Tow Foo, these Chinese food stalls serve up a wide selection of dishes with a side of either white steamed rice or soups. 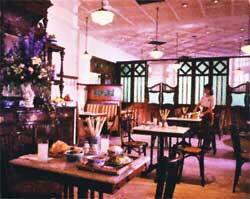 The busiest place in most stalls will usually be a zhi char stall, especially in coffeeshops. Literally meaning ‘cook and fry’, most of the dishes are oily or greasy, and because they cook to please, they tend to be delicious, hence the long lines. The Chicken Rice Company – It’s Chicken Party Time!